I waited in line to get into the fairly new, and already very popular, Multnomah Whiskey Library one evening. According to the other customers I chatted with, there’s always a waiting list. If you wanted to make reservations and skip the lines, you’d have to purchase membership, and currently they’re full. The Library was a high-ceilinged, chandeliered modern pub of dark wood, leather and exposed brick, with two of its walls covered by shelves showcasing whiskies from around the world, along with other choice hard liquors. Jaunty Scottish and Irish instrumental classics played in the background, and yet the noise level was comfortably moderate; it never got so loud that you couldn’t hear what the person was saying to you from across your table, even with all the hard surfaces. The Library made it a point to never exceed their maximum capacity of 50 customers in a room at a time, so there were never too many people loudly crowded into a room, bumping into each other and spilling their expensive drinks. As soon as I was seated and looked around, I noticed a majority of the patrons that night appeared to be in their late 20s to early 40s, with a slightly higher men-to-women ratio. My eyes explored the room and paused at a very well-dressed man sitting at a lounge chair a few feet away. He was slowly swirling a dark liquid in a snifter, possibly a Scotch. I watched him quietly sip his beverage with such obvious pleasure, and realized I have never seen a man rush through a glass of premium Scotch, or toss it back quickly. 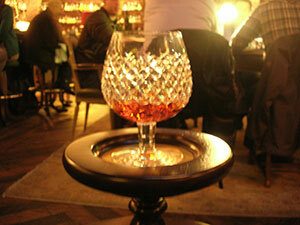 Oh, to be a glass of really good Scotch – to be tasted slowly, savored completely, and enjoyed with complete focus. This place had pretty much everything that will put you in a really good mood – world-class liquors, tasty appetizers (the bacon-wrapped dates and crab fritters were fabulous! ), and a very attractive staff. Lovely ladies greeted you at the door, my server looked like he’d stepped out of a men’s clothing catalog, the bartender with the great smile and brawny good looks was very attentive…I could go on and on. I turned my attention to the menu. The prices were a bit steep, with whiskey tastings ranging from $14 to much higher. Expect to pay for the level of selection and superiority one prefers in fine beverages, as well as for the exclusivity and ambience of a place that offers them. Classic cocktails, gins, vodkas, rums, beers, wines, and so on, were also well represented. But if you’re at a place that calls itself a “whiskey library”, you order the whiskey. I ordered a Talisker Storm single malt Scotch, from the shores of the Isle of Skye. As I raised the glass for a sip, I was pleasantly surprised by the peat-y, smokey aroma. Some people don’t like a smokey Scotch. With that first sip, a delicious warmth spread from my throat to throughout my body. I gasped softly and shut my eyes as the room swayed a bit and my cheeks tingled pleasantly. Wow. The boldness, the smoothness. And interestingly, the flavor wasn’t nearly as smokey as I thought it would be, considering the first fragrant impression. With its blend of new and old scotches, Talisker Storm managed to smooth out the smokiness. Nicely done! Aroma: Swirl the whisky around the glass and take in the aromas as they are released. Don’t poke your nose straight into the glass, as all you’ll pick up is alcohol. Taste: Take a nice, long sip and let the whisky feel its way around your entire mouth before swallowing. Finish: A good whisky should linger like a fond memory, and you will still be feeling and tasting it for minutes afterward. In my opinion, as with any all-encompassing, sensual experience, I’d say the only right way to enjoy such a moment is to do so completely and at your own pace.